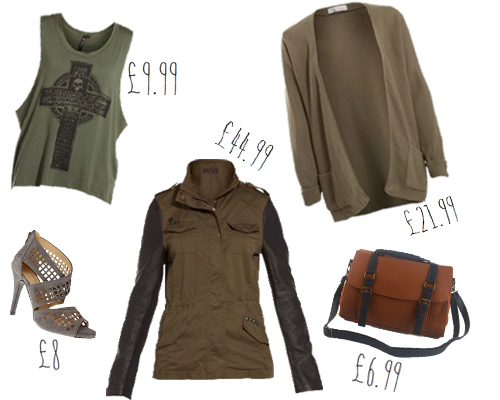 Here's the second Low Spend, On Trend post and this time it's all about army and khaki. Personally, I think these colours look great on anyone - any skin tone and any hair colour! I don't think I own any shade of green clothing at all! It's not a colour I tend to be grabbed by myself, but after creating this post I'm loving a lot of the things I've come across! My two favourite pieces here are (...unsurprisingly...) the most expensive of the lot! The jacket is to die for - I saw a similar one in Topshop yesterday, but I can't seem to find it on their website, so this New Look one will have to do! Yes, it is almost £50! But it's bound to be less than one from Zara or River Island! The cardigan would take you through until summer next year judging by the current weather in the UK. For £21.99 it's a pretty good buy I think. I've come to realise how versatile all of these colours are too - so maybe I should add some to my wardrobe! How incredible are the shoes for £8?! They only have them in a size 4 now though - so if you're a size 4, I envy you. Check out the Fashion Union site if you're on the hunt for any additions to your wardrobe as their entire site seems to be sale items at the moment. There are even more unbelievable bargains to be found! I'm hoping to take some photos of my interview outfit to share with you guys today or tomorrow. They will be uploaded at some point this week! I found some reasonably good buys and I'm pretty happy with the outfit, so I'm feeling a bit more prepared now. Ahh, love that you're continuing the low spend/on trend series, such a lovely idea! Seriously considering buying the shoes and squishing my size 5s into them - probably stupid, but they're soooo nice! Oh my gosh, i want all of these, particularly the cardigan and jacket - I HATE being skint!! I really want the topshop one too, but this new look one looks pretty much the same haha! these are great finds! love the jacket and the bag. Love these pics! Especially the satchel bag. At that price, it's a STEAL! !